I have recently started a project that has been on my mind and in my sketchbooks for a long time. It's my hope and passion that Jupiter Soup's diverse and interesting travels will capture some, if not many. The best adventure he has taken thus far however is into the blogosphere, and out of my own head. There is something magical when you can share a personal, creative side of yourselves and hope it is enjoyed by others. 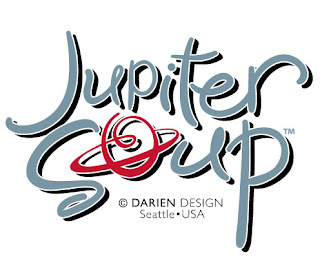 Jupiter Soup's whimsical logo evolved from my love of letterform design. I have always loved creating letters and shapes. Before I ever attended art school, I had a passion for type and letters and loved creating them over and over on phone books, napkins in cafes, and on the steamed walls of a shower door. For myself and other designers, the beauty of a letter can be like that of a well painted portrait. And who is, or what is, Jupiter Soup? Is it a person? A dog? An extraterrestrial? Or is Jupiter Soup merely a perspective of life, seen from another dimension of our brains, challenging us to see things for what they are, not just as we would want them to be. Jupiter Soup is an explorer, a blogger, an artist. He doodles and draws his thoughts and what he sees. Even he's not sure of his final destination. He's here to live, learn, love and understand the diversity of life in the universe. I should add that Jupiter Soup is, above all, from the heart.